The conceit of a “speaking likeness” is taken to its extreme in Amenable Women, a warm, wickedly funny novel about a modern-day woman and a Holbein portrait of Henry VIII’s rejected fourth wife, Anne of Cleves. Flora Chapman feels a guilty sense of relief when her handsome, charismatic husband, Edward, is killed in a ballooning accident. For years, plain, dependable Flora has played the boring foil for her dashing husband as he embraced one enthusiasm after another, leaving her to pick up the pieces. Fellow residents of the village of Hurcott Ducis smother her in sympathy; Edward was a much admired character in the tradition of the Great British Eccentric. Flora, though, looks forward to becoming a person in her own right. She finds one of Edward’s cast-aside projects, a "History of Hurcott Ducis", which mentions a connection to Anne of Cleves, an object of ridicule for centuries simply because the petulant, aging king didn’t find her a turn-on. The unfair irony infuriates Flora: Henry was repulsively obese--and seventeenth-century historian Gilbert Burnet, who first labelled Anne “the Flanders Mare”, was downright homely. Flora becomes Anne’s champion, seeking out the reality of her life and personality in contemporary accounts. She visits the Louvre in Paris to see Holbein’s portrait of Anne, which has its own tale to tell. The warmth of Flora’s interest arouses the sentient presence of Anne within the painting, stirring her to muse silently about her life, revealing her side of the story for readers. 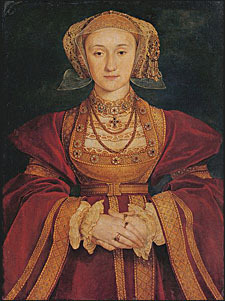 Anne of Cleves: Henry VIII's Discarded Bride by Elizabeth Norton (2010).